This is Part 5 of the Mythology story arc. Somebody has been targeting the people who made Bruce Wayne into Batman; killing Leslie Thompkins and Henri Ducard, and almost killing Alfred Pennyworth and Bruce's sensei. 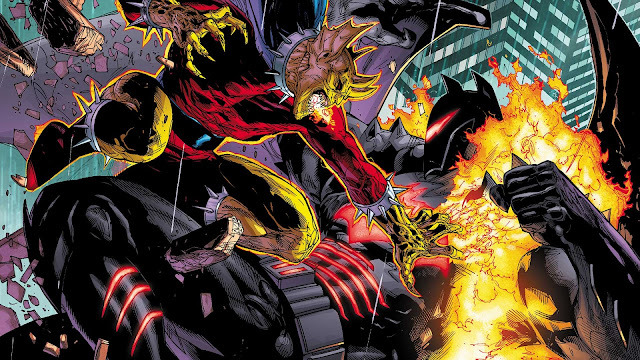 In Detective Comics #997, Batman and Thaddeus Brown escaped a tank with sharks and piranha and defeated the weird monster that has been doing the dirty work. 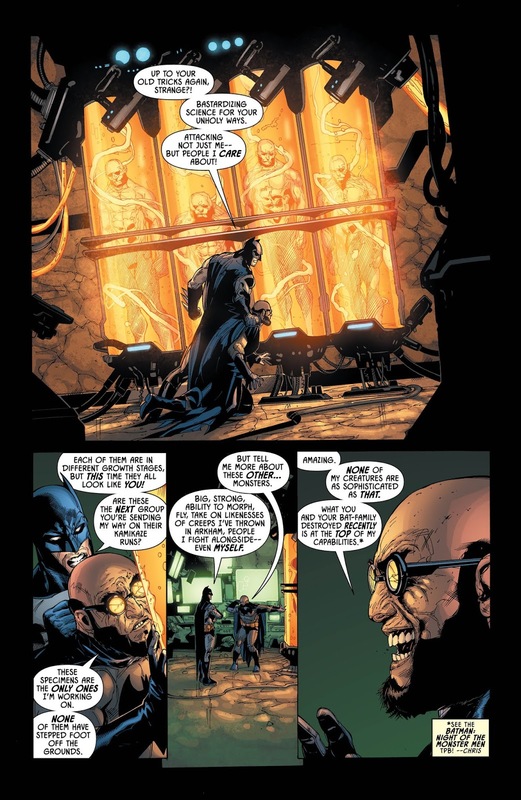 Now Batman thinks that Hugo Strange is behind this, and he's raided Strange's lab. Strange doesn't know what Batman is talking about but he's pretty excited about it and wants cell samples so he can try and emulate this morphing monster. He swears that the clones that he has currently in tanks in his lab have never been let out. Then Batman gets a call from Alfred who puts a panicking Jason Blood through in his earpiece, and Jason's call gets cut off. Batman gives Strange the backhanded Robin slap and leaves him there on the ground. 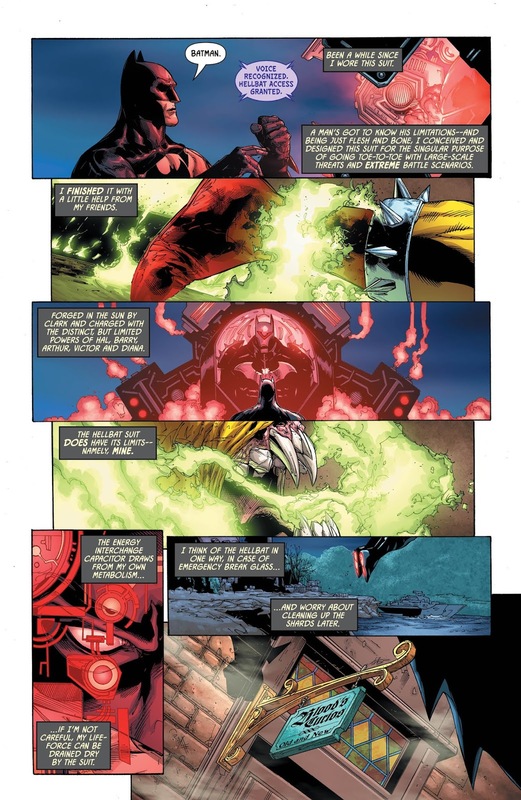 In an intense couple of pages that switches frames between Batman and Etrigan, we see Etrigon (the demon who possesses Jason Blood) being bound by green magic, and the Hellbat suit come flying down in a rocket to Batman outside of Strange's lab. He gets in the suit and flies off to Blood's shop. Batman crashes through the storefront to see a big green demon chewing on Etrigon's shoulder. The big "Batman is a badass" moment happens here while he's battling the demon. It tells him that he's going to drag him back to hell with him, and Bats say "WHAT MAKES YOU THINK I'M AFRAID OF HELL?!" and bashes him into the floor. 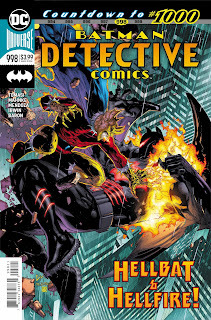 From there it takes all of his metabolism, getting close to going into cardiac arrest, for him to use the Hellbat suit and take the demon down, and Etrigon sends it back to hell. It's a good fight scene. Much better than the one from the last issue. As Batman comes out of the Hellbat suit, Etrigon lets Jason Blood come back and Jason explains that the demon was a manifestation of the fear Batman has created over the years. Batman finds one of his original grappling guns left at the scene, a clue, and asks Jason to use a travel sigil so he can get to Silas Stone. He and Silas play a little catchup and Silas looks at the grappling gun which he designed. Then he shoots the gun at Batman, who catches the grappling hook. Silas asks him what scares him, he replies "Not being Batman..." and the world around him, including Silas, turns into the green binary code from the Matrix. "... unable to help... unable to make a difference." And then, on the final page of the issue, he suddenly finds himself in the Batcave. Somebody (I'm not spoiling everything!) is sitting in his seat, and pictures of everything that has happened in this arc is on the screen behind him. This is a weird one. I have no idea what the hell is going on and where this is leading. Every issue of Mythology just keeps getting further away from anything you might be expecting. It's whacky. Did you think anything like this would be happening in this arc after reading the first issue (Detective Comics #994)? And what is up with the ending in this issue? Is none of this even happening? Is this a Matrix version of Knightmares? The art in this issue is great but the story left me really confused. I don't hate that I'm confused because we're supposed to be confused and I enjoyed reading it. Because of that, I can't wait to find out what is actually going on.